Check out Little Frida Muerte on My Redbubble Shop! I've got a sale update for you on my Redbubble shop. One of my favorite pieces, Little Frida Muerte, is now available on a few items, And if you order like RIGHT NOW, you can get 20 percent off your order with code MANICMON. The code expires at midnight, 12/4, eastern time. And don't tell Eliana, but I already have this cute tote bag hidden in the secret Christmas stash to wrap for her for Santa's stop at our house. Because yes, if she asks, Santa Claus himself has some of Mama's art on display at the North Pole, natch. If Dia de Los Muertos isn't your thing, you might like something like this! 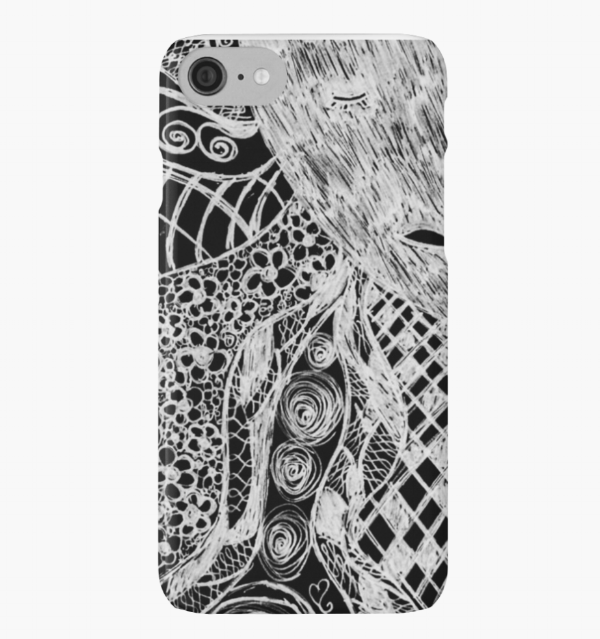 and this sweet iPhone 6 plus case I have on the way for my own iPhone! I can't wait. Stay tuned...I'll be adding more to the shop as I get prints and images uploaded and sorted. For now, click and buy now while the coupon code is still good! Oh, and if you're interested in a physical print, click the link to the name of each piece. That one takes you straight to the etsy shop.